The Plastic Logic QUE, also known as the promising but $650 Nook alternative, has been delayed until summer. 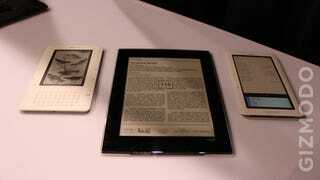 By then, will you still actually want an oversized eBook reader? For $650, upcoming Apple and/or Android tablets are looking pretty good. Thank you for being one of the first customers to order a QUE proReader from Plastic Logic. We appreciate your business. Today, I wanted to personally inform you that we are postponing the first QUE proReader shipments until this Summer in order to fine-tune the features and enhance the overall product experience. Within the next month we will send you an email with more details about your order. If you also ordered accessories for your QUE proReader, we plan to ship them at the same time as your QUE proReader. I can imagine that you want to get your QUE proReader as soon as possible. We are sorry for the delay. For your inconvenience, the shipping charges will be on us. Please note that we will not charge your credit card until your order is ready to ship. If you have any questions, please do not hesitate to email us at QUEhelp@PlasticLogic.com. Once again, thank you for being one of our first QUE proReader customers.